Where are the Paris attackers who left Kalashnikovs in a black Seat Leon? One Major Paris Mystery: What Happened to the Shooters in the Black Car? 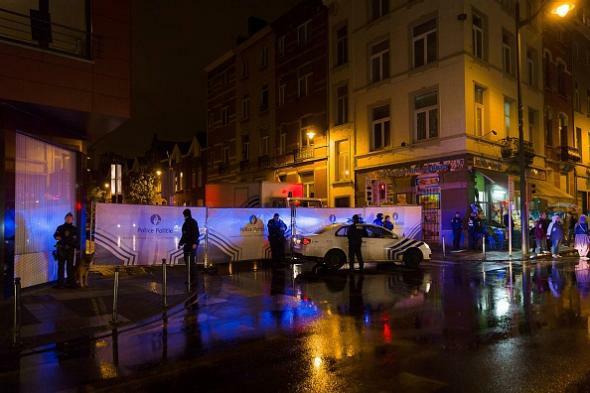 Belgian authorities cordon off a street in Brussels’ Molenbeek district during a police raid connected to the Paris terror attacks. Three French officials told The Associated Press on Tuesday that an analysis of the attacks showed that one person directly involved in them was unaccounted for. The officials, who spoke on condition of anonymity because they were not authorized to provide details about the ongoing investigation, said the second fugitive has not been identified. The shooting attacks in the city center were reportedly carried out by gunmen traveling in a black SEAT León car at four restaurants/bars in three different locations: First at the Petit Cambodge restaurant and nearby Carillon bar, then at a pizzeria called Casa Nostra, then at a bar called Belle Équipe. A black SEAT León with three Kalashnikov rifles inside was then found abandoned early Sunday morning in the Paris suburb of Montreuil. Who were the gunmen traveling in that car and where are they now? One of the men could have been Ibrahim Abdeslam, Salah’s brother, who blew himself up at a café called Comptoir Voltaire near the other shooting sites after the shootings had already taken place. Salah Abdeslam, meanwhile, was apparently stopped on Saturday near the Belgian border in a car with two other men but wasn’t detained because the officers who stopped him didn’t realize or hadn’t been told that he was a suspect. (Abdeslam’s two companions have since been found and arrested, but he’s still missing.) It seems possible that the pair of brothers and the AP’s “second fugitive” had something to do with the restaurant shootings and that Salah Abdeslam could have ditched the SEAT León before fleeing for Belgium. But four days after dozens were killed at Petit Cambodge, Carillon, Casa Nostra, and Belle Équipe, we still don’t know for sure who was responsible for killing them and whether those attackers are still at large.